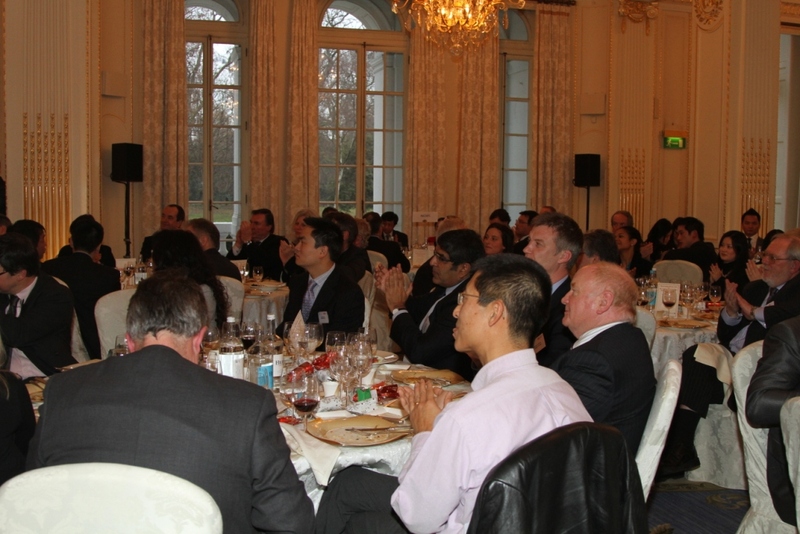 It is a great pleasure for me to address the China Association before the holiday season. May I begin with warm festive greetings to all of you: Merry Christmas and Happy New Year! The China Association, with a history of 123 years, is the oldest UK organisation in promoting business cooperation with China. It has been a forerunner and a witness to our growing business ties over the years. I take this opportunity to express my appreciation and respect to you for your long-standing commitment and hard work for China-UK business cooperation and our bilateral partnership as a whole. This is my first winter in London, which I was told may be the coldest in the UK for more than a decade. 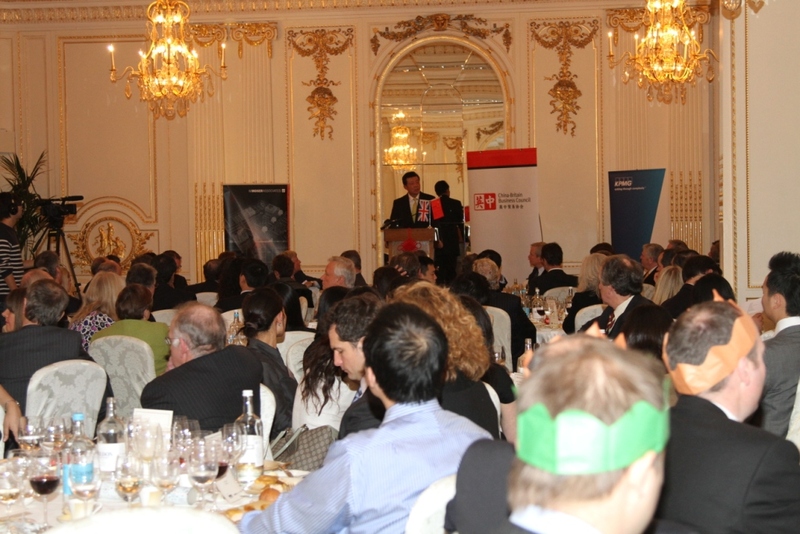 But with so many of you here, I could feel the warmth of your enthusiasm for China-UK relations. And I am glad to say that our relationship has not only maintained its warmth, but is getting warmer and warmer. First, we have had heated high-level exchanges. China-UK relations have made a smooth transition following the change of government in Britain. Prime Minister Cameron led the largest delegation ever to visit China last month and reached extensive agreement with Chinese leaders on strengthening political mutual trust and cooperation in all fields. Five cabinet secretaries have so far visited China. Important mechanisms such as the Economic and Financial Dialogue, the Strategic Dialogue and the Joint Economic and Trade Commission have run smoothly. Second, we have enjoyed ever warmer business cooperation. We have put the worst impact of the financial crisis behind us and managed to make new progress. Our trade in goods for the first ten months of this year reached 40.2 billion US dollars, growing almost 30% year-on-year, a record increase. UK exports to China jumped 43%. We have also seen robust investment both ways. TESCO, for example, has announced a plan to invest 2 billion pounds in China for the next 5 years. 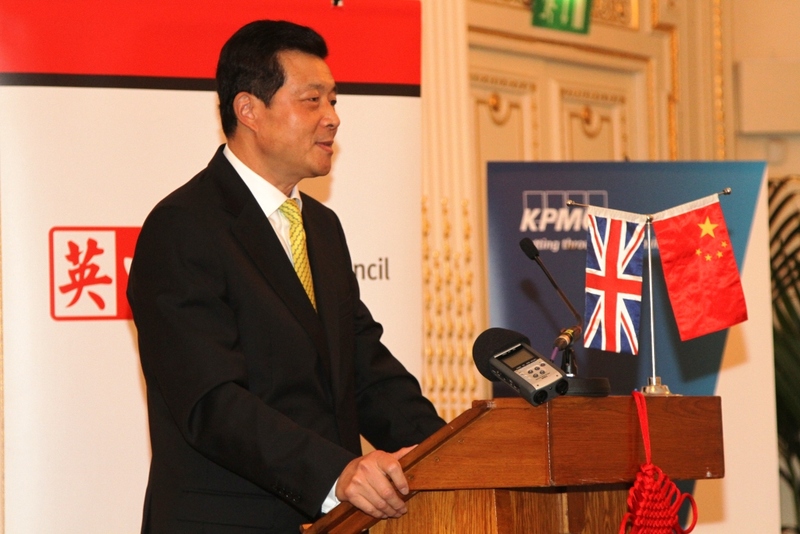 This year China also became the sixth largest investor in the UK in the number of projects. It ranks as the second largest investor in London in the number of investors. Third, we have developed dynamic people-to-people and cultural exchanges. The Shanghai World Expo was a major highlight of China-UK cooperation this year. I must congratulate you on the huge success of the UK Pavilion – it attracted more than 8 million visitors and won the gold prize of the Expo in best design. The UK remains home to the largest number of Chinese students in Europe, with more coming each year. The two countries signed an agreement to train more mandarin teachers to meet the demand of the emerging "mandarin fever" in the UK. I am particularly pleased to see that a British college student Johnson Stewart won the top prize at this year's international mandarin proficiency competition. The UK is also becoming a popular destination for Chinese tourists. According to VisitBritain, the number of tourists from the Chinese Mainland jumped a record high 80% from January to October. By the end of this year, over 200 thousand Chinese tourists will have visited the UK. China-UK relations now stand at a new starting point and promise broad prospects. Now is the time to chart the course for our relationship from the global and strategic perspective and deepen cooperation in all areas, to the benefit of our countries and peoples. While we are encouraged by the sound momentum of our relations, we should also be mindful of the potential challenges. One of the challenges is how to bridge the gap of understanding about China in this country. If you read the newspapers and watch TV, you would not miss China-related hot topics and some negative reporting and biased comments. Though they do not represent the mainstream here, but they could have a negative impact on our effort to promote friendship and understanding between the two countries. First, view each other in an objective way. Only with a comprehensive and historical perspective, can one get a full picture of what's going on in China right now. Today's China is a dynamic and ever more open and confident society combining tradition and modernity. There are now 420 million internet users, 230 million bloggers, 75 million microbloggers and one million online bulletin boards. Over two thirds of Chinese internet users, that is 280 million of them, regularly air their views online. The legislative process has become much more open with increasing input from the people. A new regulation was put in place to make government disclosure of information mandatory. And extensive public consultations are held in the major decision-making process. The ongoing heated discussions on a national scale over the 12th Five-Year Plan are a case in point. Direct elections are held all over China at the village level. While recognising the economic successes and social progress in China, the West should not ignore the political and institutional underpinnings of this progress. Second, enhance mutual trust. Some people in the West have misgivings about China. They are unsure about where China is heading and fear for a hegemonic China. They see China's development as a threat. The more developed China is, the greater the threat. Such a view shows a lack of trust in China, and even greater lack of understanding about China. Better understanding is key to building trust. I do hope those China-skeptics will try to understand the country in the context of both its history and its current development. History has shown that China is a non-expansionary power. And culturally China believes in humility and tolerance. It has never invaded or colonized other countries in its modern history, but has fallen victim to aggression. It is true that China is now the world's second largest economy. But it is also a developing country, whose per capita GDP ranks behind 100 other countries. 150 million Chinese still live below the UN poverty line. Development remains a long and tortuous task for China. To fulfill this task, China needs a peaceful international environment. It needs to live in amity and develop win-win cooperation with other countries. It needs to be a responsible player in the international system. The last thing China will do is to seek hegemony or expansion in disregard of its tradition and history. Anti-hegemonism is not only a constitutional principle and strategic choice for China. It has become part of the consciousness of every Chinese. The only option for China is peaceful development. Third, respect each other. There is no "one-size-fits-all" model for all countries. Models can only serve countries well when they are country-specific. The journey of China since the founding of the People's Republic, especially in the past 30 years of reform and opening-up, has been one of "crossing the river by feeling for the stones". Eventually China found its own road of development. Democracy is an ideal pursued by all people around the world. It does not take a single form, not even among the Western countries. It is neither reasonable nor useful to judge one country's democracy and political system by another country's standard. The democratic system in China was born with the People's Republic in 1949 and was the choice of the Chinese people. At that time, some US politicians were loudly complaining "who lost China?" In fact, the US never owned China in the first place. There was no such a question for them to lose China. Constrained by their values and thinking, it was very hard for some US politicians to understand a simple fact. It was the Chinese people who won China. And it was the Chinese people who chose the Communist Party. Today, China's democratic system has evolved with reform and opening-up. It draws upon the best political experience of mankind. China's democracy is built on the fundamental political system of the National People's Congress. It follows a system of multi-party cooperation and political consultation under the leadership of the Communist Party and grassroots democracy. This uniquely Chinese system works best for the Chinese national conditions and serves development and stability of the country. China does not impose its model upon others, nor does it want to be imposed upon. Just as we admire the sunshine for its spectrum of colours, we should appreciate the world for its diversity. We need exchanges and dialogues with an open mind. We do hope Western political leaders would not repeat the mistake US politicians made 61 years ago. China's political and social systems should be respected, so should the choices of the Chinese people. Fourth, work together for the common good. A defining feature of our world is its inter-connectedness and interdependence. Only by sharing interests and responsibilities can countries serve their own interest and the interest of others. When a storm rages, we are all fighting the waves in one boat; when it recedes, we offer each other help in repairing damages. Global economic recovery remains fragile and fraught with challenges. We need to step up macroeconomic policy coordination and prevent negative spill-over effect of stimulus measures. We need rational dialogue and cooperation to address global economic imbalances. We need to ensure that the multilateral trade regime upholds openness and rejects protectionism. And we need active global cooperation to tackle global issues such as energy, food security and international development, and work for sustainable development. Building a partnership of trust and cooperation between China and the UK, between China and the West calls for efforts of all of us. I sincerely hope that the China Association will continue to play an active part in this respect. I look forward to even greater contributions by the China Association to a closer China-UK economic partnership, to a healthy and stable China-UK relationship and to a promising relationship between China and the West. This cold winter reminds me of two lines from Shelley's poem, "If winter comes, can spring be far behind"? Founded in 1887, the China Association is the oldest <?xml:namespace prefix = st1 ns = "urn:schemas-microsoft-com:office:smarttags" />UK organisation in promoting business cooperation with China. Soon after the People's Republic was founded, the China Association advocated trade links between China and the UK and facilitated the efforts to establish the Sino-British Trade Committee, which later became the China-Britain Business Council (CBBC). The China Association merged with CBBC in 2003, but kept its name and way of operation.